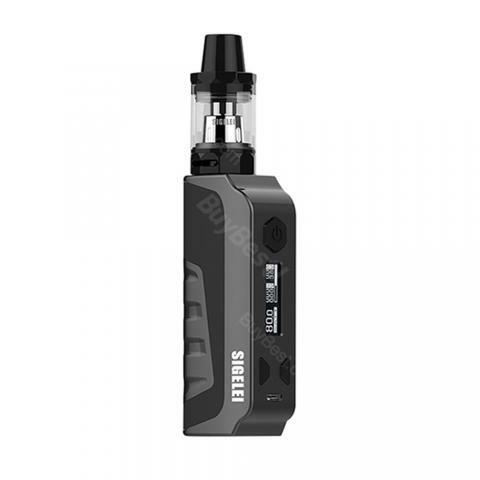 Sigelei E1 Kit consists of a single 18650 cell mod with max 80W output and SM2-H tank. Compact size and good performance makes it perfect vaping kit for everyday usage! The Sigelei E1 is a tiny sized box mod for the single 18650 battery, which fires up to 80W maximum output power. Box mod supports Power mode and Temperature control mode for the Ni200/Ti1/SS(304, 316, 317). 0.91-inch display of the Sigelei E1 will clearly display all the vaping data, menu is user-friendly and easy to navigate. The ergonomic shape of the mod gives a comfortable hand feeling, plus compact size makes it convenient to carry arouond. The SM2-H tank is included in the kit, it features top filling system with 2ml e-juice capacity. The 0.2ohm coil head together with adjustable bottom airflow will provide optimal flavor and good vapor production. Sigelei E1 kit is available in 5 colors. • No e-jucie, no 18650 lithium-battery. 80W Sigelei E1 TC Kit, with a moderate price but be superior in quality. Highly recommend to starter like me. LOL. Sigelei E1 ist sehr edel liegen sehr schön in der Hand das gefällt mir sehr gut. Sie ist unkompliziert, sieht dazu chic aus und vorallem ist sie klein.